I’m a bit misty-eyed as I write this last blogpost of 2012. How was 2012 for you? I’m guessing it was as great a year as it was for me. But what made 2012 such a good year? Was it the accolades, the material possesions we were blessed with, the places we were privileged to access? Well, not really. Even though we are thankful for all those for they were many. However it is the little things I am especially thankful for. Little things like… the fact that I had a word from God to hold on to all year round. A promise that kept me going when I couldn’t see a way. When I felt tired, frustrated, confused or alone. Knowing I had a promise from the promise keeper … For that I’m grateful. That I could choose to read my bible whenever and in public without fear of persecution or death. 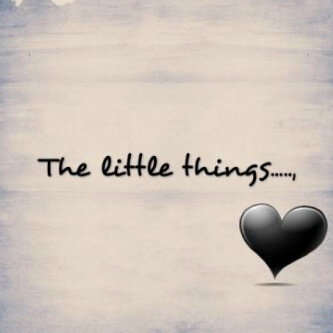 Little things like… The people that showed me love. Those that helped me, that prayed for me, my wonderful pastor “grandpa Rev” like my daughter calls him; Rev Albert ‘Femi Oduwole who asked throughout the year “how are you?” And meant it at the exact times I needed someone to ask. My wonderful DCC family- office staff and church workers; tireless in their belief in God and the assignment He gave us. It’s the little things like those who said thank you to me this year. Those who accepted our ministry and appreciated it. Oh! Can I ever get over Cece Winan’s “Alabaster Box”? Or Donnie Mcclurkin’s “yes I will trust you Lord!”. Its the fact that I could sing, that I could breathe, that I could laugh, pray, cry or just be still in God’s presence in 2012 that made it all worth it. Little things like the wonderful people I met or got closer to in 2012. Too many to mention but I’ll just say I was blown away by the people God sent my way but I’m even more thankful for those he removed from my path. Sometimes we take for granted what God does to get us to where we are. It’s those seeming disappointments that I’m thankful for because they turned out to be blessings in disguise. I’m thankful for the tests because they became my testimony. The books I read, the ones I started writing that I hope 2013 will make a reality. The blogs I followed- yes its simple things like waking up to an early morning blog post especially from my darling eziaha or from femme totale or max lucado or… The list is endless. These are just a few of my faves. In fact just being able to read made 2012 a fantastic year. Honestly I could go on but I guess what I’m trying to say is that even though a lot of big things happened in my life in 2012. If we’re really honest with ourselves, it’s the continuous and consistent supply of the little things that made it all worth it. Its seeing God in every thing, the big miracles but also the “little” things. Some of the things we take for granted are not so common to the man in the hospital gasping for breath or the man in syria wondering if today is the day he gets killed by a bomb or the christian in Iraq hiding from neighbours lest he be killed for being an infidel or the woman who even though she has lost both breasts to cancer just got hit by a car while crossing the road from the hospital where she went to do a checkup or the mother who after waiting eight years to have a child loses him to a negligent househelp. I’m turning back to give thanks. Please join me. In fact join us to CROSSOVER into 2013,@ Davids Christian Centre (DCC), Fatgbems bus stop, behind Nepa, Amuwo, by Mile 2. service starts at 9:30pm. I sooo love U̶̲̥̅̊ mama mi. Happy new yr. Thank U̶̲̥̅̊ for being such a blessing and for being strong! Thank you Mama for always being there – rock solid, always there..
Just want to thank God for using you and pastor K to bless our generation. I am a man but i read your blog and it inspires me a lot not on what is particular for women but all christians. just finished thanking God for the little things as you rightly put it. Thank you for this mama. So funny how many pple like me can say ”Thank God” for that big thing and also easily remember what they don’t have but take those little things for granted. One of them for me is being a part of this great family – DCC. And Thannnnnnnkkkkkkkkkk you for the song, been wondering how i can get it.